In a brisk consumer market where brick-and-mortar retailers face the challenge of convenient online shopping, store operators are paying keen attention to attractive store design and targeted marketing for customer appeal. Creating the allure of a positive shopping experience is a key part of the equation. New Hope Network, which bills itself as “the premiere digital marketplace that connects the healthy lifestyle industry from supply to shelf,” recently published research results based on interviews with hundreds of natural food retailers that could apply to other retail segments…citing store layout, lighting, and how unique products are merchandised. Such direct, tactile appeal can help capture shopper allegiance and repeat business. Beyond structural rearrangement, in-store target merchandising needs to be displayed strategically and prominently to build the buzz. Not even online shopping can guarantee that eyes will fully engage with cross-promotions. Direct, eye-to-eye contact gives retailers a sterling opportunity to boost profits. Making targeted promotions grab attention brings us to Lucky’s Market in the New Hope study. With an eye toward new products, Lucky’s vice president of merchandising, Andrew Vialpando said “a main point I strive for is discovery.” Vialpando’s goal is to make food shopping more of an engaging experience than chore-like drudgery. That’s where new acrylic Sign Holders and point-of-purchase signage can make a significant difference. Impulse Sign Display Holders including swivel-base and designer oval-shaped Literature Displays deliver eye-catching appeal and attention to your own unique retail specials. 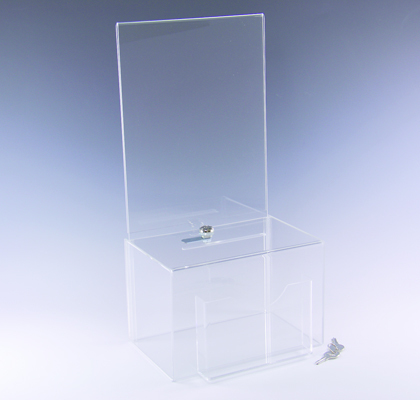 Acrylic Sign Holders and Display Stands Make for a Prospering Business. Happening now, Plastic Products Mfg (PPM) has announced that current sale specials will run through June 30th, significant price reductions on Style A Sign Holders, Style B Display Stands, and Style C 8-1/2” x 11” Sign Display Holders. Each style also features Plastic Products Mfg’s proprietary thicker material at a sturdy .098. Popular Style A Sign Holders and Table Tents benefit greatly from the tougher thickness while delivering an eye-catching slanted angle to the base. Ideal for showcasing everything from furniture and electronics to hospitality/rental car upgrades and bar/restaurant specials, June specials and thicker material make A085110ST an investment with added value. Thicker gauge material is also a strong attribute in Style B Display Stands. It’s an attractive showpiece that’s exceptionally functional and user-friendly with top and side loading capability. The display stands atop a triangular base, well-anchored by the .098 thickness. Refer to B085110ST for June’s special pricing. Style C is geared for high-visibility, high-profile areas with heavy foot traffic. 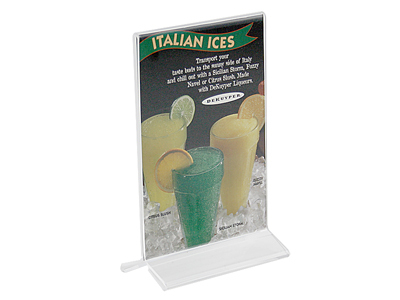 This 8-1/2” x 11” Sign Display Holder is a vertical bottom loader with double-sided viewing. Thicker material on this particular style (C085110ST) makes it especially durable, long-lasting, and an effective addition to POP campaigns. Your sign holders and table tents are an important part of your branding and marketing effort. They need to compliment your promotional materials not detract them. A great sign holder provides a clean and professional image for your company and helps communicate your message directly to the people that matters most; your customers. Online ordering is available now on Plastic Products Mfg’s website and questions / customization requests are welcome. Special sale offers end June 30th! As the economy continues to rebound, retailers find themselves facing more challenges than ever with other brick-and-mortar operations as well as online sales. Every detail counts to get that extra marketing edge and capture customer’s eyes. In a visual world that’s crowded with consumer choices, making yourself memorable means adding some “zing” to those details. Increased brand/name recognition – Shoppers compare. Count on it. While your brands and prices are being scrutinized, seize the opportunity to be first in your comparison shoppers’ memory. Your competition’s POP Displays just might look a lot like yours…but customizing can give you the edge with a little “wow” factor and a more memorable association, connecting that advertised product to you. Attention Grabber – Launching a new promotional campaign? Customization helps draw attention above and beyond. In large and/or “busy” showrooms, this approach can help stop foot traffic to showcase that promo. You might be surprised how strategically placed acrylic displays highlighting your graphics, colors, and text make in-store ads more effective. Flexibility – The variety in acrylic Literature Displays does not have to be confined to countertops. Poster Holder styles can be screen-printed with store or manufacturer logos in Wall Mount and Ceiling Mount versions, giving you broader reach at eye level and even slightly above in more crowded spaces. Consider the benefits of double-sided advertising in custom Ceiling Mount Poster Holders to maximize the coverage. Digital Printing – Take your custom graphics and design to the next level and make your POP Displays undeniably attractive. Plastic Products Mfg (PPM) offers Digital Printing to complement traditional silk-screening and screen-printing capabilities. It’s the next generation in optically pure acrylic and plastics…adding near-artistic brilliance to Sign Holders, Brochure Holders, and Sign/Brochure Holder Combos. You may have seen it already with names from Bayer to Pfizer. Cost Effective – Nearly ¾ of shopping decisions are made in-store. Are you conveying the right information to inspire a “call to action?” Do your displays offer that subtle suggestive marketing push? Customizing POP Displays can help seal a purchase and it costs surprisingly little. All it takes is an e-file to get started, and from there, customization is easy to replicate…a clean, crisp look in high volume runs. That makes for a minimal investment and return with unlimited potential! Tried and True Method – So you’ve launched a new promotional campaign and marketed accordingly to bring customers through the door. What next? You can target in-store buyers better and spotlight your brand and promo more effectively building on a familiar, traditional approach. Acrylic POP Displays are nothing new. It’s all in the custom look that takes them to the next level, adding function and aesthetic appeal to the latest acrylic cuts and shapes. With a personalized look and style, the possibilities are endless! There’s no denying the enduring qualities of Acrylic. 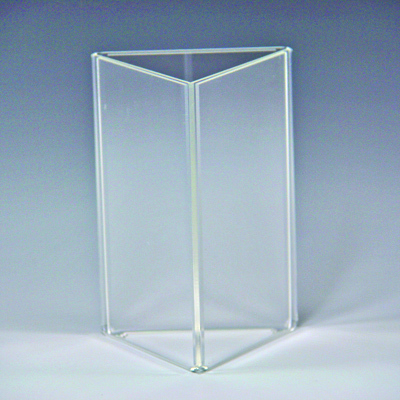 For decades, Plastic Products Mfg (PPM) has built a sterling reputation in manufacturing and distributing world class POP Displays, Poster Holders, and Literature Holders of all sorts thanks to the incredible properties of quality Acrylic. But a leading innovator never puts all its’ eggs in one basket. Giving customers alternatives in Plastics opens the way to new choices and cost-effective alternatives, specifically in Styrene. Functional and durable, Styrene’s composition is lighter in density than Acrylic. But don’t mistake that for weaker or more prone to cracking, scratching, or breakage. In reality, Styrene holds up remarkably well to knocks and repeated use over time. From an ROI standpoint, that alone is a big plus for Styrene in POP Displays, Sign Holders, and Poster Holders. In addition to high-grade plastics, PPM also offers wood products like Magazine Holders, Chart Holders, and Glove Dispensers for the medical field and specialties like aluminum Poster Frames. But when it comes to Sign Holders, Table Tents, Brochure Holders, and POP Displays, nothing surpasses the quality and affordability of plastic. The only question remaining is the choice between Acrylic and Styrene. If you still have more questions about the debate and want to discuss the benefits of either or both, just talk to the experts in the PPM Customer Service Department. Representatives are always ready to help you explore your options and pursue those best suited to your marketing campaigns, display placement, and budget. No matter which way you’re leaning – whether it’s Styrene or Acrylic – you get the best of both worlds with PPM, hands-down! According to the National Restaurant Association, 2014 restaurant sales hit $683.4 billion…jumping nearly $96 billion in just four years. With steady growth and no slowdown in sight, the restaurant industry is expected to add 1.3 million jobs over the next decade to help meet foodservice demands. Indicators also point to another profitable year ahead for restauranteurs. Of course, tough competition will determine how those profits are divided as restaurant owners and managers scramble for an advantageous edge. This is where smart marketing and presentation are key factors – not just getting customers through the door – but also in building guest checks. Advertising those all-important specials to a captive audience with attractive Table-Top Sign Holders, Table Tents, Menu Holders, and Multi-Sided Sign Holders can provide a HUGE contribution to your “per guest” averages. It’s all about suggestive selling, and using POP Displays to your advantage is like giving each member of your wait staff a personal sales assistant. Acrylic and Leatherette Table Tents are a great start. You can show a lot in a basic double-sided Table Tent to both sides of a booth or table. Menu specials and colorful drink incentives are easy to switch out from either side of the acrylic Table Tent Sign Holder style, ideal for continual updating to attract new customers via word-of-mouth while capitalizing on inquisitive repeat customers’ wishes. A wide range of standard size options can also help accommodate your print materials. In the Leatherette Table Tent version, you also get stylistic options to match your décor. Though made of a vinyl material, Leatherette Table Tents closely resemble genuine leather to offer a classy touch to tabletops and bar tops. They are also available in different color options. Want to multiply your sales opportunities per table? 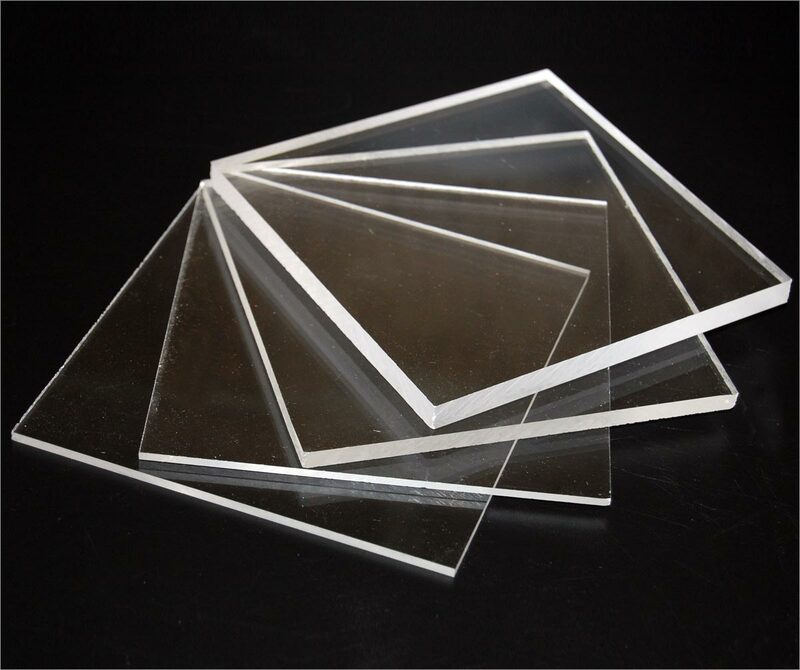 Consider six-sided Lucite and eight-sided Plastic Sign Holders. Both offer magnificent views to more hungry eyes…perfect for larger tables. Higher volume plus more options for your customers equals better profit margins. The only limit on these Ad Holders is your imagination. By the way, how do your Menu Holders showcase what you have to offer? When you think about it, it’s your menu that tells customers what you’re all about. It’s the single most defining connection between your success and the customers who will make or break you. Give your menu the spotlight it deserves in a vertical standing acrylic Menu Holder…also a good idea for bar tops and wine lists. Plastic Products Mfg (PPM) can also help you create added brand awareness with custom imprinting on your Menu Holder’s sloped base. Got the best Margarita special in town? Customers won’t forget where to find it. Does your operation count heavily on take-out sales? PPM’s Brochure Holder options are designed in multiple sizes so your customers can easily grab “to go” menus. A well-crafted, easy-to-read menu meant to travel gets a lot more attention when you give it a prominent place in an attractive Brochure Holder. Remember that building future sales can be just as important as the present if take-out sales are significant. Here’s another area you should consider: customer feedback. Sure, you can gauge success in dollars and cents…but not always. If business fluctuates, it’s especially important to get customer feedback and find out why. Set up a Ballot or Suggestion Box and encourage your customers to tell you their likes and dislikes…then adjust accordingly. Numerous styles of Large and Small “Donation” Boxes are available to help accumulate these most important opinions. Honing a sharp edge in the restaurant business applies to more than kitchen knives. From Acrylic Easels to four-sided Restaurant Sign Holder / Table Tents, take advantage of every angle with crystal clear viewing acuity. PPM has the POP Displays that will help pique customer interest, right there at the table. They’re already sitting and hungry, why not give them more of what they want? Boost your per guest sales with Sign Holders and Menu Holders geared specifically for your foodservice operation, bistro, fine dining establishment, or franchise. A comprehensive catalog is available right now at www.plasticproductsmfg.com. Orders for standard styles can be processed right away for shipping, and PPM’s legendary Customer Service can help with custom orders and screen-printing. Bon apetit!